Puri Nirwana’s main living areas, master suite and one guest bedroom occupy a contemporary two-storey ocean-facing building, linked to the two-storey Garden Wing sleeping pavilion behind. From the grand pivot-door entrance, an open reception area leads into the villa, where the dining room runs the full length of the ground floor, opening onto a formal living room to one side, and the Master Suite and media room (with French doors to the kitchen) on the other. From the reception area are stairs to the open-sided lounge, ocean-vista living room (which doubles as the villa’s seventh bedroom) and Sea View guest suite. Colonnaded verandas link this building on both levels to the Garden Wing where two ensuite guest bedrooms occupy each level, linked by another staircase as well as an elevator. A separate joglo within the gardens houses the villa spa, and at the beachfront is the pool, sundeck, balé and dining gazebo. With an excellent choice of formal and casual living areas, guests at Puri Nirwana can gather together in comfort with space to spare, or retreat to quiet corners away from the crowd. The formal living room is bright and breezy, with a wall of glass doors opening onto a sun-drenched terrace. Upholstered sofas and chairs cluster around a large coffee table, encouraging genial conversation. Leading off is a gallery lined with glass-fronted cabinets containing the owner’s curios and collectibles. Above is a colonial-style living room sprawling under a soaring four-pillar teakwood joglo core. Here, plantation shutters filter the sea breeze or can be flung open to make the most of the fabulous 180-degree ocean vista. Languish on the four-poster daybed, or convene around the semi-circular sofa for a sunset cocktail. Those happy to sleep without air-conditioning can also have this room made up as a bedroom; there is an ensuite shower room and a long vanity with double basins. Also on the second level is a breezy open-sided lounge protected to one side by a bank of plantation shutters, with pool table, and dining table for six commanding stunning sea views through a trio of open arches. Running the length of the main pavilion is the formal dining room, oriented to the ocean views beyond a wall of glass doors that can be closed for air-conditioned comfort or opened to the breeze. Dominating this space is a monumental table formed from the cross-section of a massive tree, which seats 16 in supreme comfort, and up to 20 without a squeeze. Sandwiched between the dining room and the professional kitchen, the media room is a magnet for guests of all ages who seek the pleasures of a movie or Sony Playstation in air-conditioned comfort. Sit back on a soft sofa or recliner with a magazine, browse through Indosat’s many TV channels, or choose a DVD and settle in front of the 55-inch TV. Or simply lie back and admire the traditional Kamasan paintings adorning the ceiling. The kitchen is huge, well equipped and features dual gas ovens, hot plates, a glass storeroom and twin state-of-the-art refrigerators. It’s the domain of the chef, but guests are welcome to make full use of it too should the urge take them. With its prime oceanfront location, it’s no surprise that the beach is the focus of the Puri Nirwana’s outdoor living space. The villa’s social hub is the 16-metre swimming pool with jacuzzi and shallow section for smaller kids – and nothing to separate it from the beach except for a low glass fence. Standing sentinel at either end is a raised balé, deeply cushioned for daytime siestas and people-watching, and a vine-covered gazebo backed by a tropical jungle scene wall, with clusters of seating providing alfresco dining for 12. In between, over-sized bean bags rest on an ironwood deck under a row of towering palm trees and traditional Balinese parasols. By the villa entrance is a colonnaded veranda where rattan chairs invite repose. Within the landscaped gardens is a children’s play area with sand pits and castle-building toys, and a performance area where local villagers can be invited to perform traditional dances or play gamelan before the serene backdrop of a massive Buddha face. Hidden within Puri Nirwana's tropical gardens is an elaborately carved Javanese joglo with a distinctive trapezium-shaped roof. This romantic antique building houses the villa’s spa, with massage beds and chairs, hair styling and mani/pedi sections, a garden bathroom with a copper bathtub, sit-up Japanese style tub and a shower courtyard. 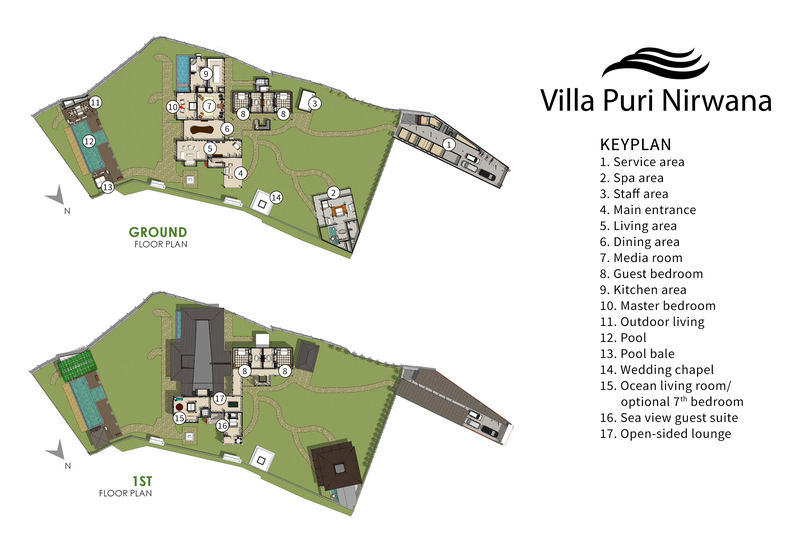 Villa Puri Nirwana has six air-conditioned bedrooms — two in the main villa and four in the Garden Wing, complete with elevator. Each features comfortable king-size four-poster beds swathed in mosquito netting, creatively decorated ceilings, and lavishly appointed ensuite bathrooms. The enormous Master Suite occupies prime position at garden level in the main villa building, poised to enjoy the far-reaching view across the lawn towards the sea and Nusa Penida. This palatial marble-floored suite is larger than many a modern-build villa. The huge bedroom has a wall of folding glass doors opening onto the lawn, and perhaps Bali’s largest ensuite bathroom, with a generously sized three-basin vanity, walk-in wardrobe, and a separate room with a pair of rain showers side-by-side, and statement oval bathtub. Connected to the main villa by shady colonnades and verandas, the Garden Wing houses four air-conditioned guest suites, each named for the colour of their richly decorated ceilings. Two are on the garden level and two are upstairs, reached by a staircase and – a rarity in Bali villas — an elevator. In each, the bed rests under an ornately decorated ceiling, with a queen-size trundle bed tucked away underneath — ideal for families with young kids, of four kids sharing a room. Plantation-style shutters filter the light, closing for privacy or opening to the cooling sea breezes and glorious garden views. Beyond a curtained opening is a large handsomely tiled bathroom with marble floors, twin vanities, rain shower (two in some bathrooms) and bathtub commanding centre stage. The only bedroom on the upper floor of the main building, the Sea View suite may be the smallest but it has the largest view. Enjoy sweeping ocean vistas from the four-poster bed or from the room’s private balcony, furnished with wrought iron table and chairs. The ensuite bathroom is equipped with a rain shower, and right outside is the upper level living area with pool table.